I attended a local model and figure show last month. I figured showing what I entered would be a good way to wrap up what I’ve done over the past year, and start postings new things after that. 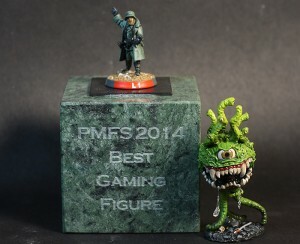 I entered 10 different items, both models and figures, in several categories. So, without further ado, in approximately the order I finished them. This is a 1/8 plastic kit made by Moebius Models. I had some problems putting it together, but nothing too bad. I only had green stuff putty to cover the seams, and I discovered that it is not very good for sanding. So some of the seams where not nearly as smooth as I would like. 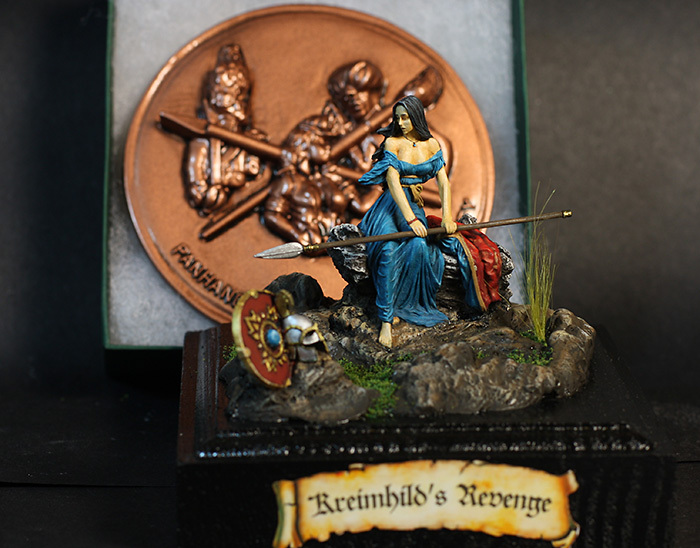 Most of this is painted with a brush, but I did some airbrushing just before the show, mostly on the ‘victims’ dress. 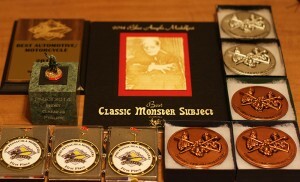 I entered this one in the ‘basic’ category, and it ended up winning the price for Best Classic Monster Subject. This is a 54mm model by Andrea Miniatures. I didn’t run into any major issues with this one. At one point I had the idea to make it look like it was raining, by making the ground shiny and the shoulders of the coat darker as if they were wet. I made the ground shiny, but that’s as far as I got with that. It wouldn’t make much sense for him to sit outside playing the violin in the rain anyway… On the violin I used some ink instead of paint. I think it turned out ok, but the ink I was using was very old (I bought it back when I was doing calligraphy, about 20 years ago) and so much of the pigments had settled, and it was very thin. I ended up using several coats instead. I entered this one in the ‘basic’ category, and it won a silver medal. This little figure is by Darksword Miniatures. I tried to make the color pattern in the face like Rista the beagle my family had when I was growing up. This was entered in the ‘painting’ category, and was the only entry that did not win and prize or award. A 1/24th scale model by Lindberg. This is the first model I’ve built in at least 25 years. It turned out pretty good, but I did make several mistakes, mostly with glue out of place and pieces misaligned. I sprayed on the paint and finished with a couple of coats of Future floor polish. At the end I tried to make it shinier with some car polish, but that actually messed up the surface and made it look a lot worse. I used metal duct tape for the shiny bits. 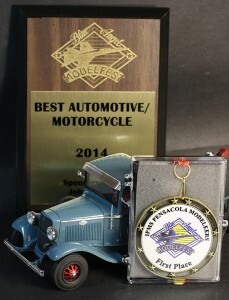 This model got a gold in the truck category, as well as the price for ‘best automotive/motorcycle’. I found this model on sale for a couple of dollars in an outlet store. It is made by Revell. It was easy to put together, and I spent more time on getting the finish right. I used Vallejo Air for the orange with a custom mixture of yellow and red. I then covered with several coats of Future Floor Polish. I also tinted the windows. For this I used black food coloring gel mixed with Future. It was a bit of a mess, and it took several coats to get it dark all the way out to the edges. It tended to pool up in the center before it dried. The black stripes are stickers that came with the model. I probably should have masked as sprayed on those too, but the stickers were easier, and it looks ok from a distance. This model won a gold in the Automotive, Street Standard category. 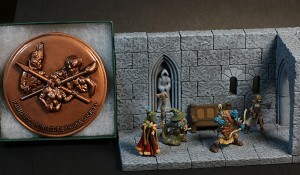 I did not participate in the Reaper Bones kickstarter last year, but I have picked up several of them in the local hobby store. 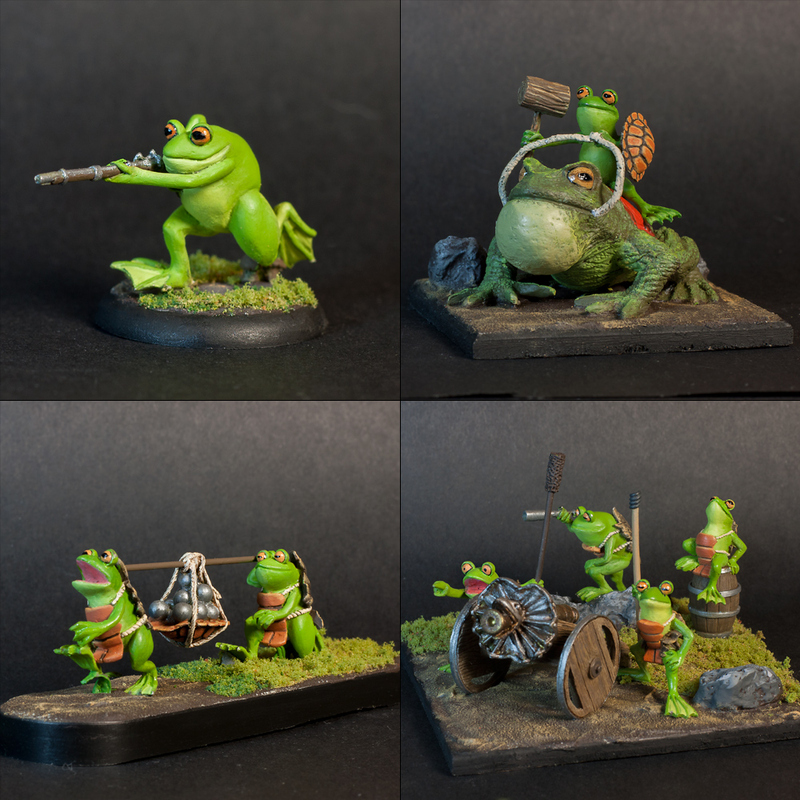 Since I had several painted I thought I’d make a small vignette instead of entering them all individually. 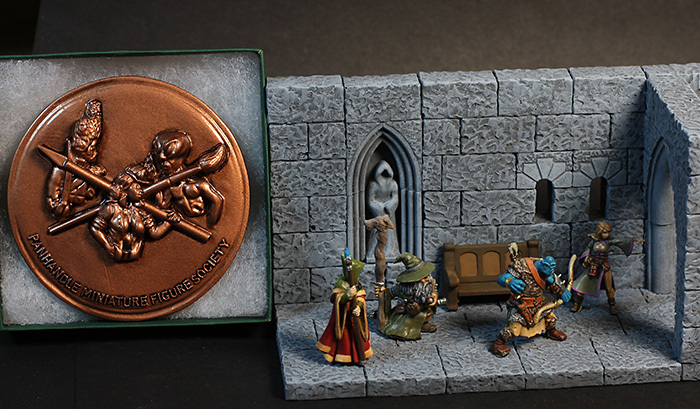 The setting is built with Hirst Art Molds. 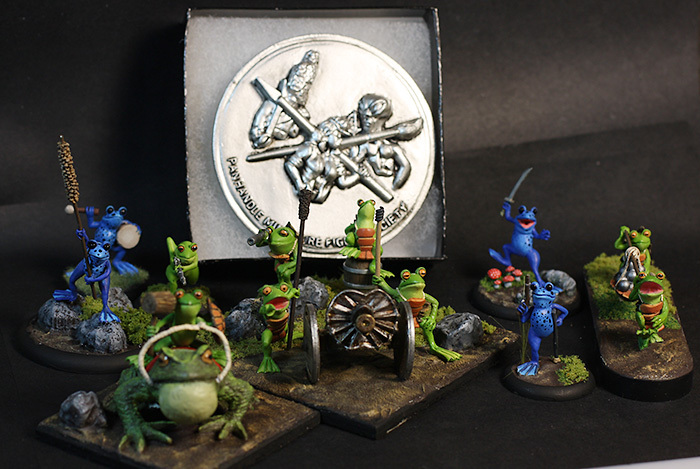 These are all 25mm heroic scale. I entered it in the ‘vignette’ category and it was awarded a bronze. 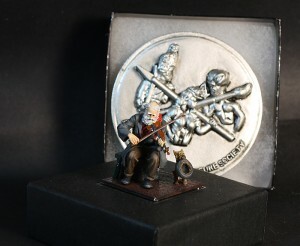 This 1/32 model is made by Lindberg. I think weathering models looks like fun, and this was my first attempt at that. For this I used three different colors of paint with hairspray sprayed in between. I also applied some salt in between to get a irregular pattern in the rust splotches. Then once the paint is dry, I rubbed is off using various tools. I heated the tires over a candle and pressed down on my work surface to make them look flat. I might have gone a bit too far with the weathering, but it was fun, and I will definitely try this again. 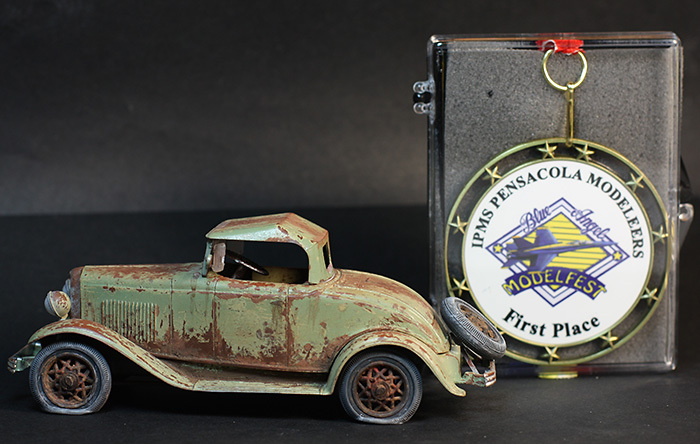 This model won a gold in the ‘automotive 1/25 scale or smaller’ category. 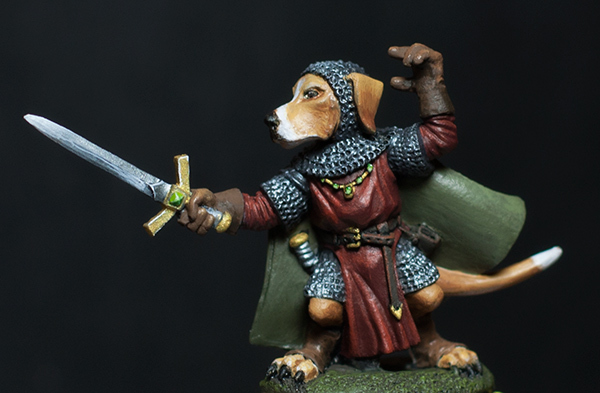 The Eye Best is part of the Reaper Bones line. 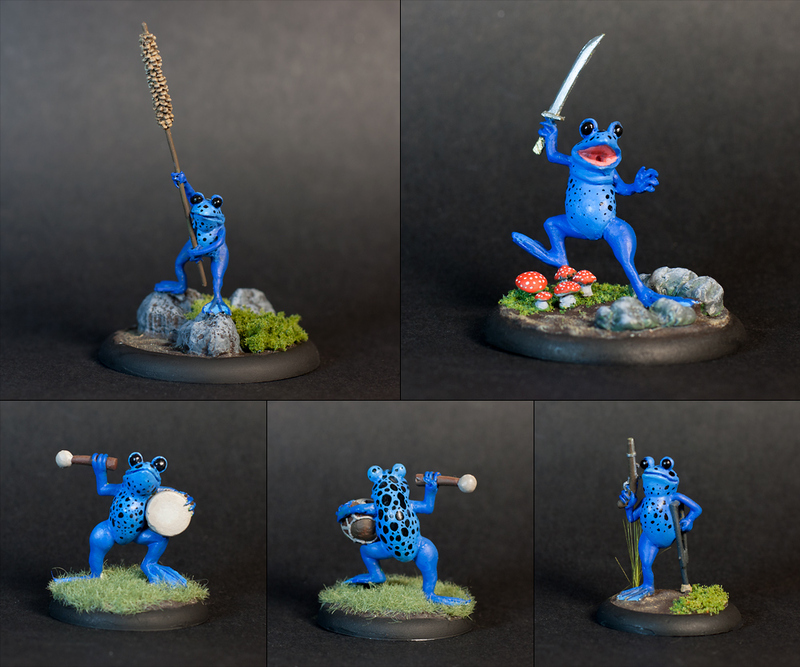 For this I sprayed on the green, and painted the rest by hand. 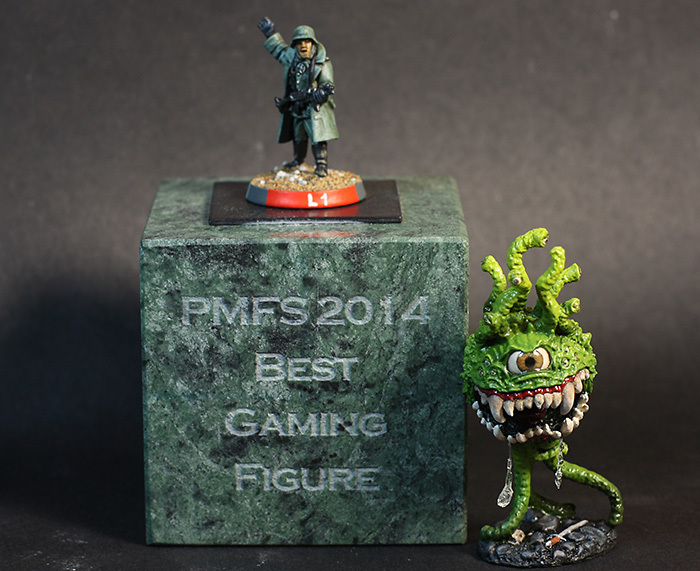 This figure won a bronze in the ‘gaming’ category, as well as the Best Gaming Figure prize. 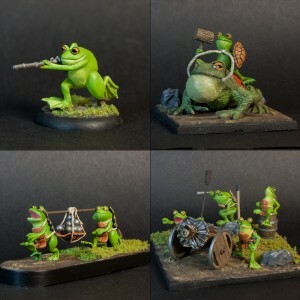 These little frogs are made by Eureka Miniatures, and are part of their Pond Wars line. The were a lot of fun to paint, though I ended up working on the in the very last minute the morning of the show. I actually have a few more figures with different poses, but these were the only ones I was able to finish. They were in the ‘gaming unit’ category and they won a silver. 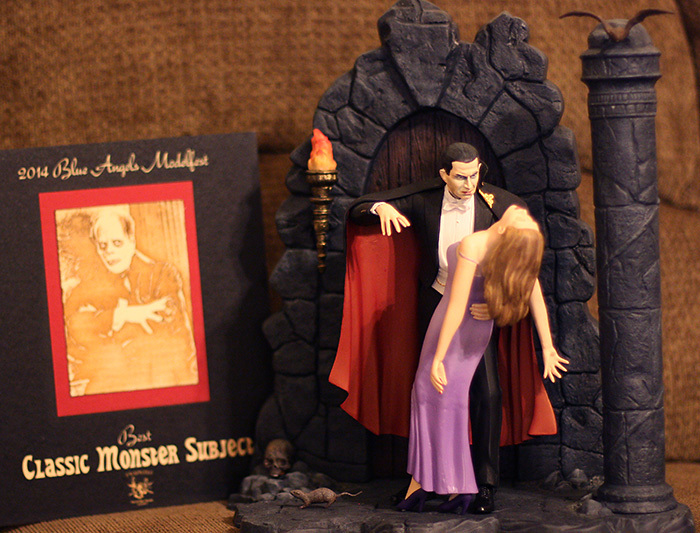 This is a great looking figure by Morland Studios. My paintjob doesn’t really do it justice. For this I made a small base using various molds and dental plaster, as well as some freehand sculpting with putty. This won a bronze in the ‘painting’ category. I had fun as the show, and it was great to see some of the amazing paintings of others. 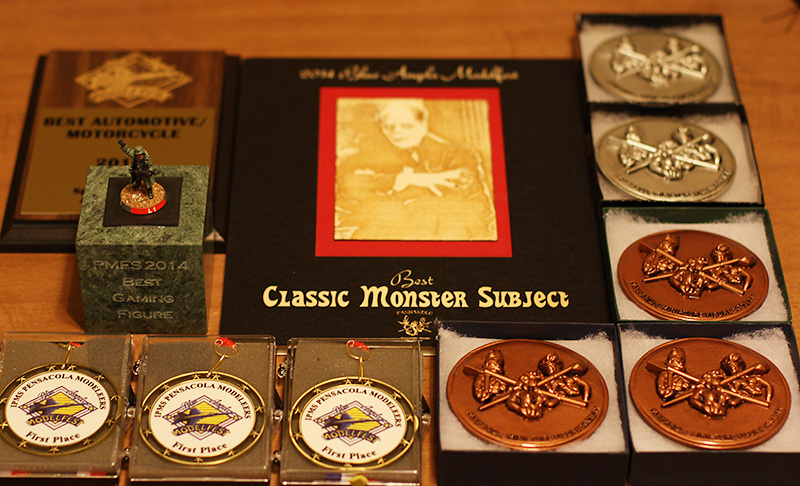 I was pretty lucky, as well, to win a few prizes. 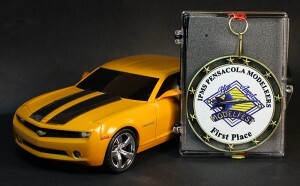 To be honest, some of the categories were not that competitive, especially the automotive ones. The ‘loot’ from the 2014 Blue Angel Modelfest.